As a child of God, your Heavenly Father has prepared a way for you to be successful in every area of your life. It’s called divine favor and it was bestowed upon you to moment you were born-again! In “The Law of Favor,” Dr. Bill Winston shows you straight from the Word of God what divine favor is, and how to use it to fulfill your God-given destiny. Your destiny in the Kingdom of God is not determined by your ability or by your intellect; it’s determined by God’s favor. 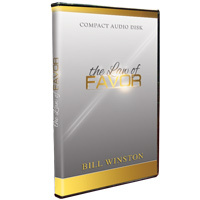 Let the revelation shared in this series help you to release God’s favor in your life when you begin activating the Law of Favor!